It needs time to understands the trend of fashion, right? 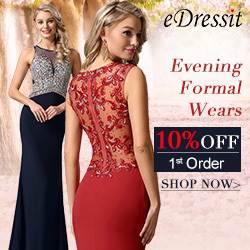 eDressit understands your needs and it sort out its hot sale dresses together to make your selection easy. As we all know that black prom dresses are classic and effective to showcase women's femininity, so they are ever fashion in many occasions: prom, evening events, wedding party, graduation and homecoming, dating, etc. Pay attentoin to the dress size and your figure when you select.